I hit the water at seventy-five miles per hour. The impact should have been fatal but all I broke was my lower arm and my breastbone and sustain some major bruising. All 26 of the people who have survived jumping off the Golden Gate Bridge hit the water feet first. I dived head first and felt myself go down that way, although my eyes were closed and I was completely relaxed. I remember the eery silence once I was off the bridge. Then as the wind accelerated I felt a fierce coldness. I didn't feel any regret going down. Instead of plunging underwater, I hit the surface and apparently floated there long enough for a tugboat (the Raven) to pull me out of the water. I remained in the hospital only long enough for doctors to place a splint in my left arm that was removed a year later. I declined psychiatric therapy and no one pressed me to get it. I went back to the waterfront a few years later and looked at the bridge. It was strange to be there, with the towers in the distance and the waves lapping nearby. 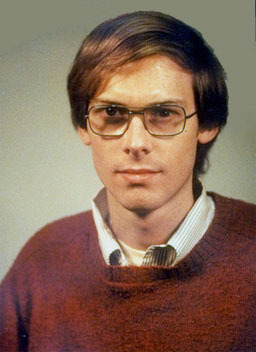 This was me four years later, in 1979, at age 26. I lived for the remainder of the decade in a third floor room of a house that my parents rented from the university. I saw very few people and spent most of the time in my room. One thing that I did in these years, though, was learn how to fly a hot-air balloon. My motive for this originally was to use a balloon to visit an uninhabited island in the West Indies (Navassa) that had interested me as a possible place to set up my own society. I was allowed to join the university student balloon club, and I learned how to fly after serving as a ground crew member. My interest in visiting the island turned into an interest in setting up a book recycling project to benefit schools in the West Indies. In 1977 I raised some money to ship publishers overstock almanacs to the Jamaica Library Service, and in 1978 I delivered more books in person to a school on St. Eustatius, a Dutch island in the West Indies, that also had interesting ruins to explore. This is the Princeton University balloon that I learned how to fly. Once you ascend above the treetops, everything becomes very quiet. You have no control over your horizontal movement and you navigate by going up and down, picking up a breeze and letting it guide you. I went up to 5000 feet once. All balloon landings are crash landings but if you allow yourself enough room you can glide in gently.